Canadian Brass plays "Penny Lane." LEXINGTON, Ky. (Jan. 28, 2019) — The University of Kentucky Singletary Center for the Arts will present the globally celebrated Canadian Brass in a performance with the UK Wind Symphony 7:30 p.m. Saturday, Feb. 2, in the Singletary Center Concert Hall, as part of the SCFA Signature Series. The Canadian Brass has developed a uniquely engaging stage presence and rapport with audiences. Each of their concerts show the band’s full range from trademark Baroque music and Dixieland tunes to new compositions and arrangements created especially for them. 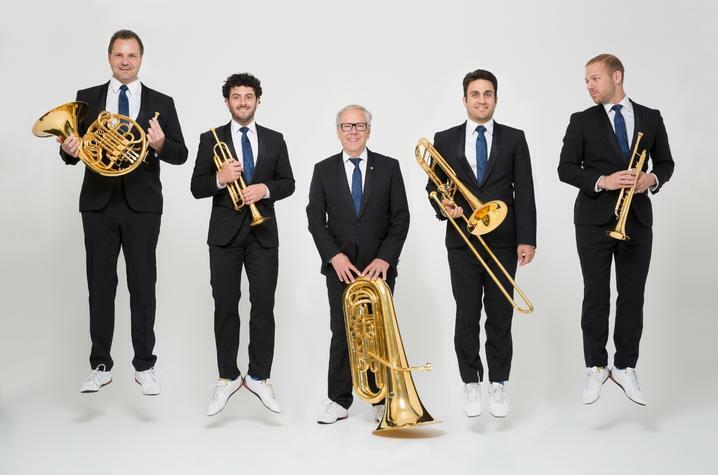 With a discography of over 130 albums and an extensive worldwide touring schedule that has taken the group from places like Australia to South America, the Canadian Brass is an important pioneer in bringing brass music to mass audiences everywhere. Since the inception of the group in 1970, Canadian Brass has sold over two million records and has seen work reach the Top 25 Billboard Classical Chart, going as high as no. 2. These accomplishments have given the group the distinct title of "the world's most famous brass group." With over 600 pieces of work that includes music from critically acclaimed composers Michael Kamen and Don Gillis, the group has a vast catalog that ensures a performance that all audiences can enjoy. The UK Wind Symphony is home to some of the finest wind and percussion graduate and undergraduate students in the nationally recognized UK School of Music. The Wind Symphony continues a rich tradition of performing some of the finest traditional and contemporary compositions in the concert band and chamber winds repertoire. Tickets for the Canadian Brass and UK Wind Symphony concert range from $28-$35 based on location of seating. Tickets for students are $18 with a valid UK ID. Discounted tickets are also available for UK faculty and staff directly through the Singletary Center ticket office. Ticket processing fees will be added upon purchase. UK students may receive a free ticket in advance by showing their student ID at the Singletary Center ticket office up to the day before the show. Tickets are available online at www.scfatickets.com, by phone at 859-257-4929, and in person at the Singletary Center. A part of the UK College of Fine Arts and essential to the School of Music, the Singletary Center for the Arts presents and hosts artistic, cultural and educational events for the university community, Lexington community and the Commonwealth of Kentucky. Canadian Brass will perform at UK's Singletary Center for the Arts on Feb. 2. Photo by Daniel D'Ottavio.